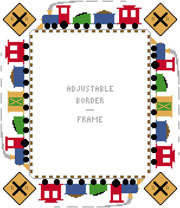 This large toy train border / frame is adjustable. It will appeal to many ages. Instructions for adjustment are included. The corners are enhanced by images of railroad signs. A complete train is shown on each side. Whole stitches are used.